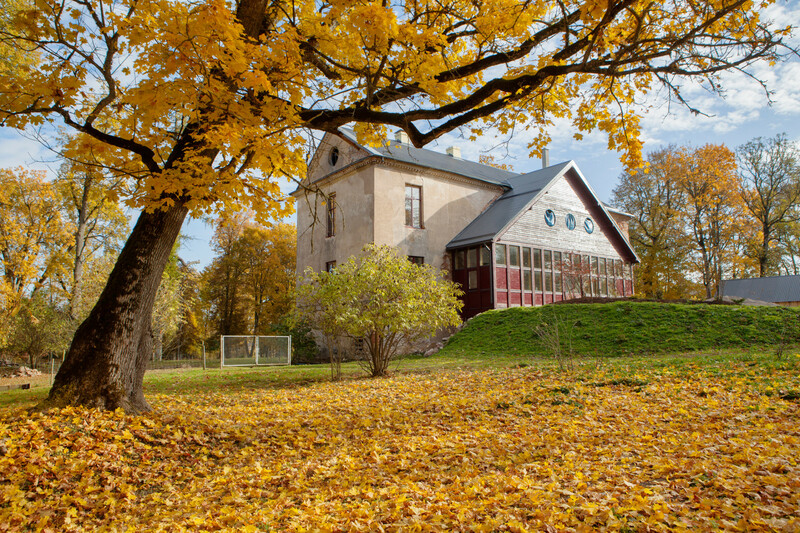 (EN) To get to Laukmuiža manor, the road leads through wide-open fields, sleepy villages and former kolkhozes. Finally, smoke rises above bright blue roofs that stand out from the otherwise muted tones of architecture in the Kurzeme region of Western Latvia. 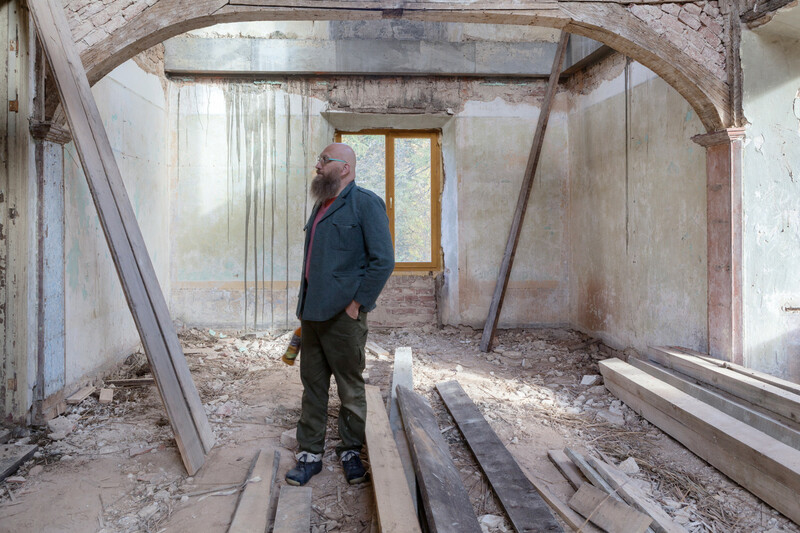 On one of the last days of an especially golden fall, sculptor and lord of his own manor Aigars Bikše is experimenting with a DIY oven, trying out a recipe for home-smoked lamb. 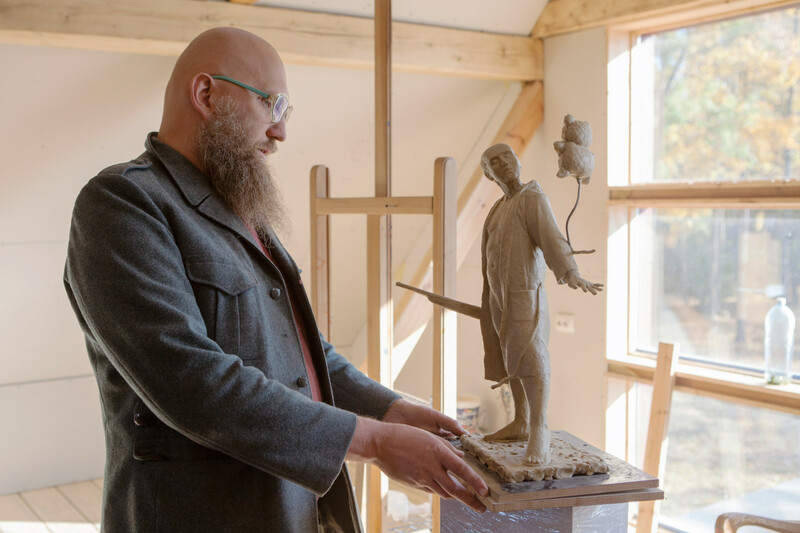 (EN) With his trademark bald head, beard, and glasses, Bikše has been a recognizable figure on the Latvian art scene for 20 years. Bikše’s irreverent and political sculptures have been seen from Riga to Venice and Tokyo, while his eccentric sense of style is perfectly matched to his role as the head of Fashion at the Latvian Academy of Art. An avid traveller, he recently returned from a residency in the Philippines. 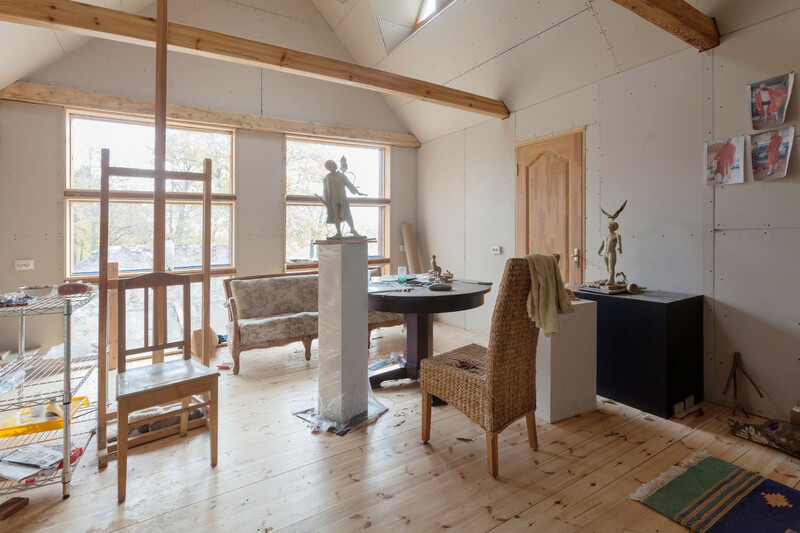 Aigars’ studio is located in a previously abandoned 200-year-old countryside manor. 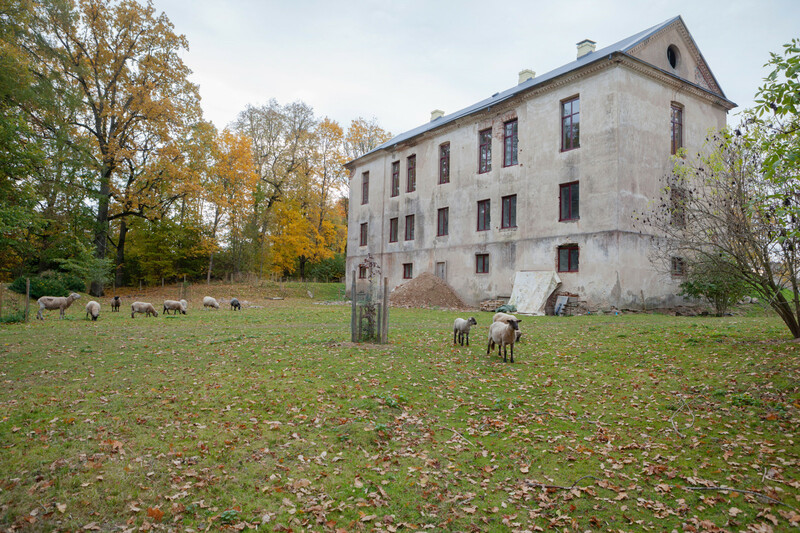 Undertaking the restoration at his own pace, the manor and its surrounds provide welcome distance from the buzz of the capital Riga, 100 km away. His provocative sculptures stand throughout the grounds and studio, including one of Vladimir Putin as a mythological centaur. (EN) The manor park is also home to a flock of sheep, while in the golden canopy squirrels are at work. An overgrown pond with a central island brings to mind bygone aristocratic times. Layers of history are visible here. History and memory especially fascinate Bikše. As he tells his story, he notes that memories are always shifting, and that this will all be his subjective interpretation. (EN) Aigars, what is the story of this place and how did you end up here? (EN) I first discovered it in the 1980s, during the Soviet time when I was 16-17 with a couple of friends from the art college, now Riga Design and Art Secondary School. I was already interested in history and we heard about this great empty manor. It was completely overgrown, the house was in ruins, and the roof had fallen in. We wanted to create a cultural center here, but we were too young and no one took us seriously. Then I returned later, in the 1990s, when I was a bit more serious already – I was a practicing artist. I somehow persuaded the local municipality that I would be a better caretaker. I think they were just glad someone took on the responsibility! 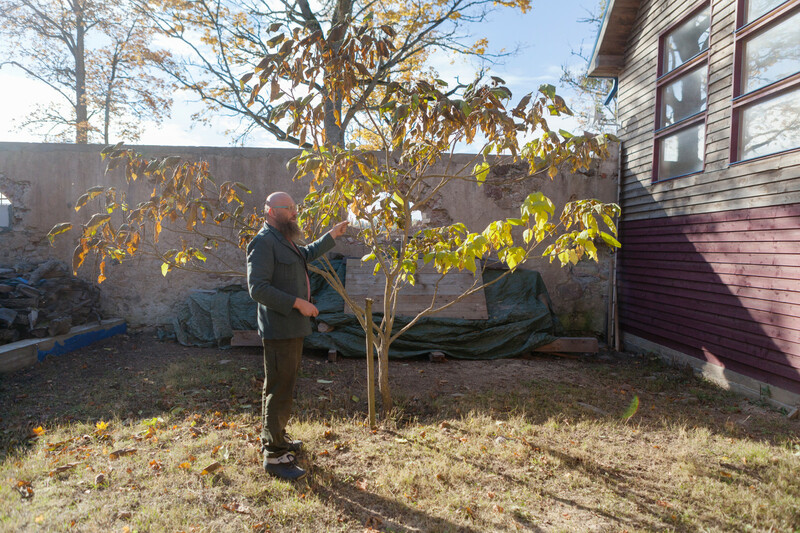 In the beginning I stayed in a tent, slowly started sawing some trees, finding some neighbors to help. Now we’re using a couple of the buildings to live and work in. The large manor house itself is a still a work in process. There’ll be a place for us to live and I’m also planning an exhibition space. I have a bit of a crazy idea to create a collection of religious and cult objects. I’ve already brought back quite a few from around the world. (EN) And at what point did the sheep arrive? (EN) As we began cleaning up the park, we realized that mowing the lawns is hard work. Flocks of sheep used to graze in Hyde Park as well – they’re very good at it and eat everything – even new saplings, if we let them. Now, since about five years ago, I’ve got a real biological farm – the sheep have a fence around them, but otherwise they’re living on their own like forest animals. Sometimes I don’t see them for weeks. They even like being outside in the winter when it snows, although they also have a barn. I’ve become a real old country man – when I go to Riga, I’m always calling friends and asking “Will you take some lamb?”. (EN) Your sculptures are often situated in and comment on the urban environment. 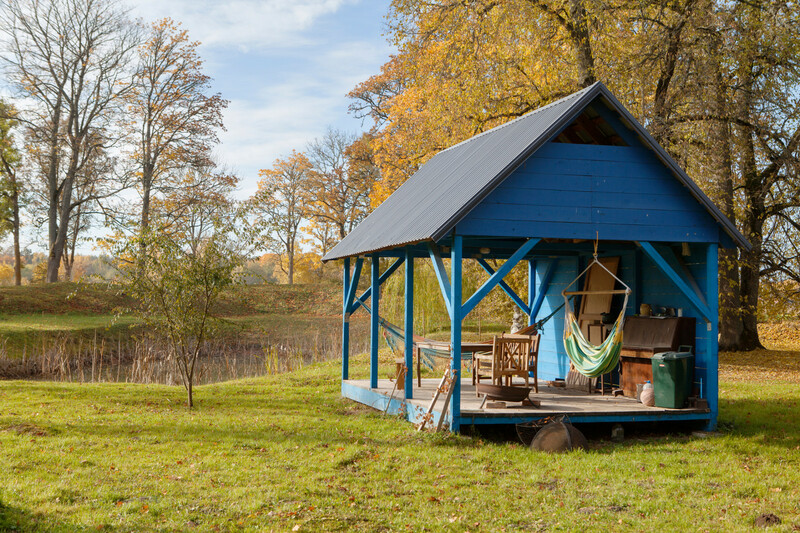 Has working outside the city influenced your practice? (EN) The urban environment and the historical and physical context of a city are very interesting to me, but I really enjoy working out here. 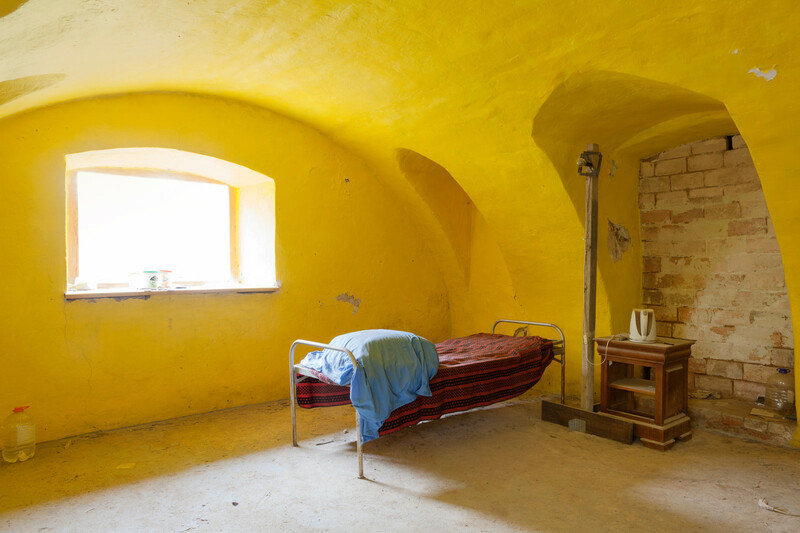 I also have a studio in Riga, but the difference is, when someone calls me there and says, “ ‘Please come…’ or ‘I need…’ ”, well – I will probably go. Since everything is nearby, I’ll go out, meet everyone, and time disappears. Whereas if I’m here, I can answer, “No, I’m in the countryside, working.” Like the Japanese tea ceremony you have to cross a river to get to – the distance is both symbolic and practical. I’m not the best at planning my time, especially with all the students I advise at the Academy. Whatever comes, I take it. But the distance here mobilizes me – I have to make more specific plans for the days I am in town and I like that. I also have some special rituals here like swimming in the pond every morning, all year round. (EN) “The Red Slide” was created for the Rauma Biennale, Finland in 2012. 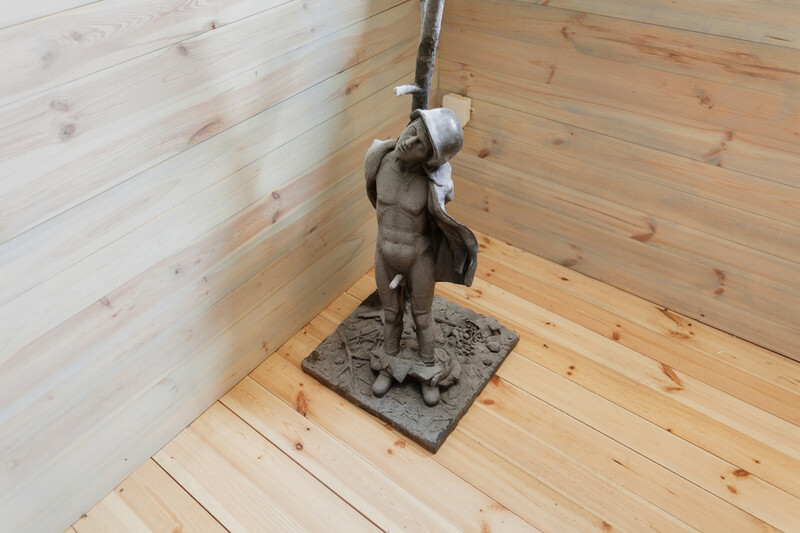 The sculpture depicts a wounded soldier of unknown affiliation, in the style of Soviet monumental sculpture. When it was displayed in Riga, it caused a small scandal – the Russian media mistakenly reported that it was a Nazi soldier. However, Aigars emphasizes that the image is a reference to all military powers and the social role of the soldier as both defender and aggressor. It is also a working slide. (EN) You can really feel echoes of the past here, and the theme of history threads throughout your work. Where does this interest in history come from? (EN) It’s definitely rooted in my boyhood love of adventure. I found out recently that the part of the human brain that deals with memory also predicts the future. 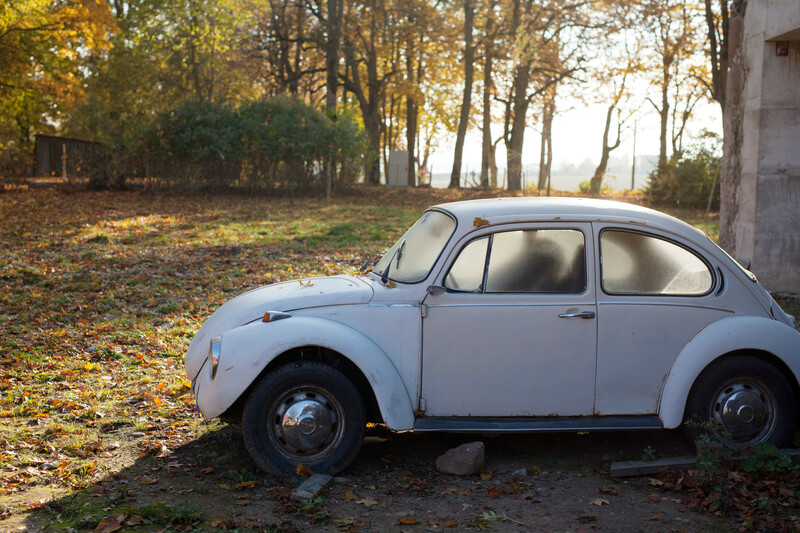 There have been studies of people remembering things that haven’t happened – false memories. Actually, all human memory is a construction. Nothing is truly real. This interests me immensely – that all of history is a construction based on who remembers what – a matter of interpretation and subjectivity. I’m especially interested in how political needs are played out by constructing and interpreting certain versions of history. 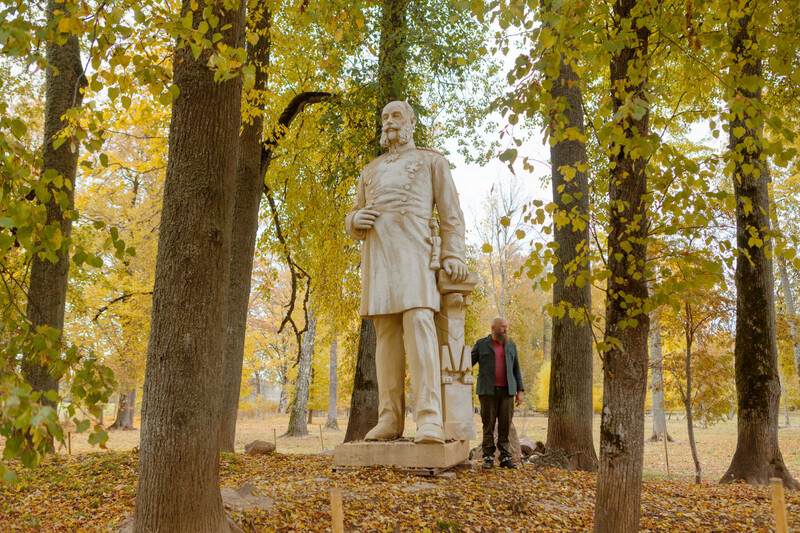 (EN) Your project for the Riga 2014 European Capital of Culture, Monument Wars, was a witty comment on the various political superpowers that have ruled Latvia over the centuries, standing on the former spot of a Lenin statue. Do you think that the post-Soviet region has a special relationship to history, and is it important to you to address it through your art? (EN) I think these issues are equally interesting everywhere. But in Latvia, we are at a crossroads. Looking back to when 12th century German crusaders brought us Christianity, we became part of the Hanseatic league – a Northern European cultural space. Then we were ruled by Sweden, until Peter I and the Russian army took Riga. Throughout the time of the Russian Empire, German was still the main language in cities here. Then came the time of national romanticism and independence, followed by many years in the Soviet Union. Now the North and West influence us again, but there are still many people who follow Russian television and media. Because of all this, our local interpretations of history are especially diverse and fragmented, which forms a rich background for my work. 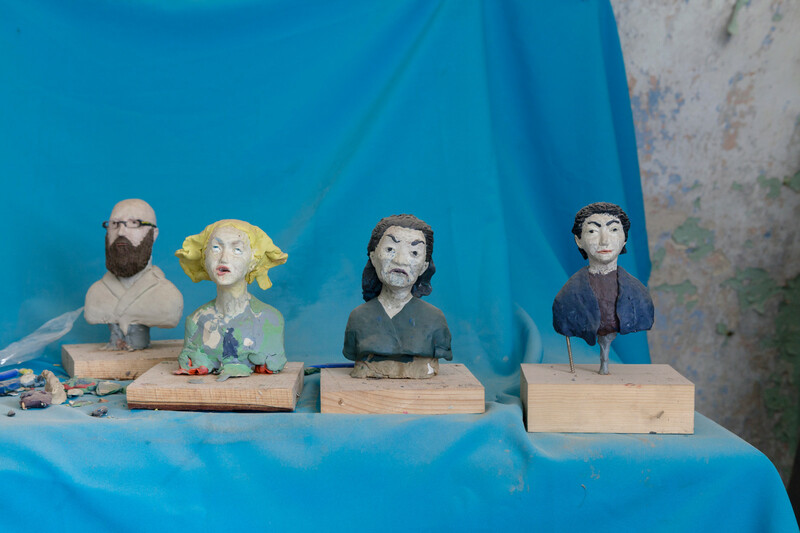 (EN) The small sculptures throughout the studio are mostly models, drafts and some works from Aigars’ previous solo exhibitions, many of them focusing on political and military themes. (EN) This carved wooden door travelled by ship from Jaipur in India, where I was collaborating with local woodcutters. They had it in their workshop, but didn’t see it as anything special. Although it’s just the door of a house with no great religious value, the decorations are very intricate and you can see it has been worked on by numerous craftsmen over time. 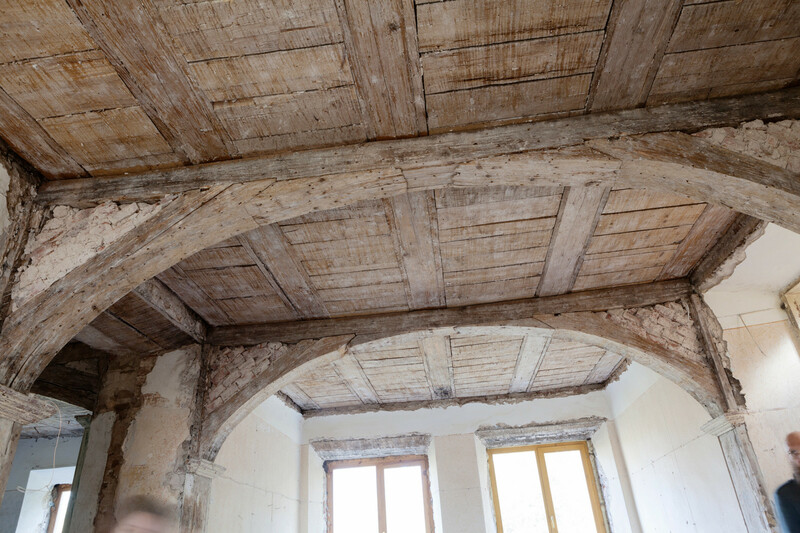 (EN) Have you also done some research into the history of this manor? (EN) A little. I had a visit from the descendants of the Baltic German family who used to live here and left in 1939 before the war. They had old photographs with them, and it looked unbelievable – the grand old house, great beds of roses. At one point, more than a hundred years ago, one of the landlords had an impressive collection of art here – sculptures and paintings that can now be found in museums around Latvia. He used to organize exhibitions, just like I plan to do. 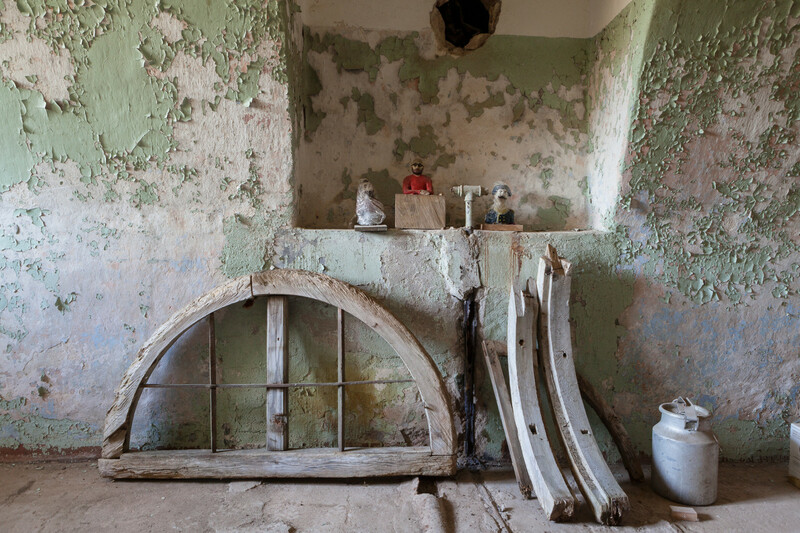 Throughout the war and the Soviet period, the manor housed an army hospital, a shop, a makeshift cinema, a storage space for tractors, an old folk’s home and family apartments before it fell into ruin. Perhaps I should be grateful it wasn’t well looked after – otherwise some more wealthy person would have liked to get their hands on it. (EN) Have you spent time collecting the furniture here or has it come to you by chance? (EN) Each piece has its own story. The bed in the studio is a creation from several old headboards, put together for me by an old local carpenter. The table is a reject from a shop in Riga that used to sell wooden furniture from Thailand. Some of the furniture comes from my childhood house in Jūrmala, and I also skim through advertisements from time to time. I really appreciate old, solid wood furniture for its quality. (EN) Your wife Jana Briķe is also an artist. Do you work here together? (EN) How did you become interested in sculpture? (EN) As a kid, I was hooked on playing strategic games with plasticine, building cities and armies. My childhood seemed to never end, and I was still playing with soldiers when I reached high school. My mother thought I should study something serious – become a dental technician or the like. I wasn’t really into that. But since I kept playing with plasticine, the idea of art came up. No one in my family was an artist. But sculpture was seen as the most practical of the arts those days, and so I ended up at the arts college. I was a student during the transition period, when the Soviet Union collapsed and everything was changing. Suddenly, no one was sure of their future anymore. Students drank even more than today! (EN) What are you working on currently? (EN) At the moment I’m working on a project for the Saitama Triennale in Japan next year. Saitama is a huge city on the outskirts of Tokyo, and art is one of the ways they want to create their distinct identity. I’m planning to erect a 10m long Buddha-salaryman at a children’s playground. I also have a project on the famous Latvian author Rainis in the works. That’s not going as easily as I had hoped. At times I’m not sure whether this is the right direction – and these moments are the most difficult. If you clearly see something isn’t working, that’s good, as you can change it straight away. But if you’re not quite sure, then you just have to work through your doubts until you really get it. I’m also preparing a solo exhibition of smaller and larger sculptures. I’m very interested in the human as a social being in Western culture, and how this has changed. We have become more focused on the individual, on living for yourself, instead of maintaining large families that used to act as social security. 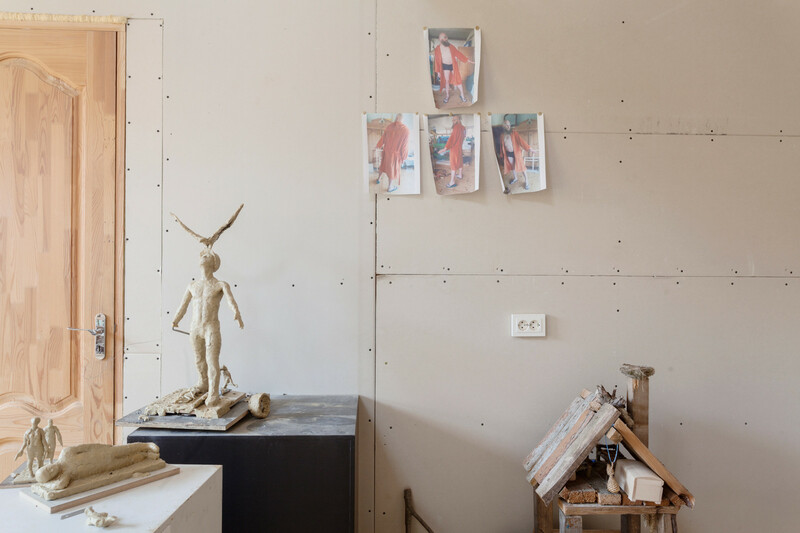 (EN) You’re a sculptor yourself, but also head the Fashion department at the Latvian Academy of Art – quite a contrast. How did you become involved in the fashion world? (EN) When our rector was looking for a new head of the Fashion department, he said to me, “Listen, you’ve always dressed kind of crazy!”. While I don’t see myself as a fashion guru, I’m happy to have the chance to develop the department for the students, and to involve lots of fresh talents in teaching. I like moving between two worlds – the glamour of fashion and the solidity of sculpture. It’s refreshing not to linger too long in either. Being involved in fashion has also given me the chance to travel and meet great people. (EN) Since you have a genuine insight into the young generation of fashion, could you describe any Latvian trends? Are there any names that stand out to you? (EN) The most interesting Latvian fashion seems to feature elegance with a twist – something that is slightly off. Like a classic suit with an unexpected cut. Of course, there is no formula – if there was, I’d be doing it myself! Of Latvian designers, MAREUNROL’S are well-known and very good, but their work is not available in shops. I do believe fashion should be accessible. Agnese Narnicka of One Wolf, who teaches at the Academy, is a good example. Laima Ūdre and Arvils Linde are some of the students who have stood out in recent years. (EN) And finally, what’s next for the manor? Do you think it will ever stop being a work in process? (EN) I love run-down places that no one else is interested in. Starting from nothing and creating something – there is so much opportunity. For me, it’s like art. In Riga, our flat and studio are in an old fire station, which started out as the worst imaginable place. No one else saw any potential in it, so I could do exactly what I wanted. People often tell me that I still have so much to do here at the manor, like I should be worried. But I’m not – I don’t have to do anything! Just slowly bobbing along at my own pace. All is as ready as it should be. Everything here is half-wild, half-natural, and I like it like that. I don’t dream of smooth, manicured lawns and hedges. It’s a pleasure to fix this place up, but equally, nothing bad would happen to these stones if I just let them be. 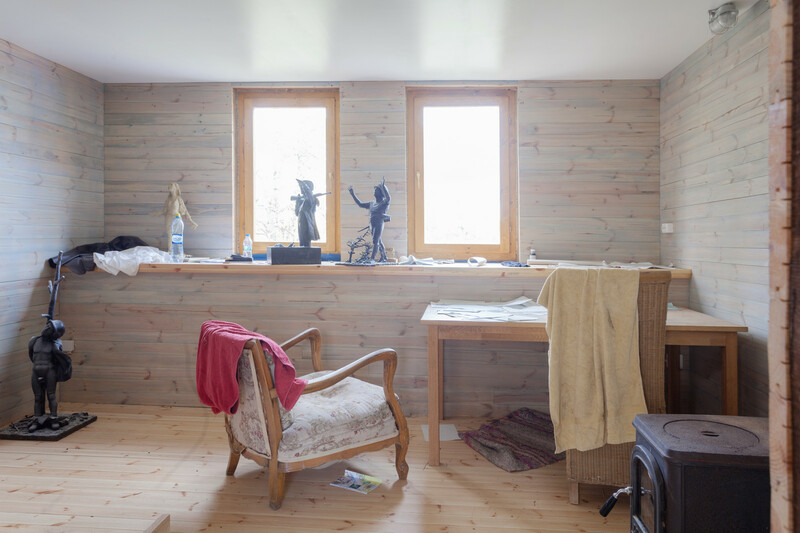 (EN) for sharing your studio and residence and giving us an insight into your history and inspirations. Explore the artist’s work here.